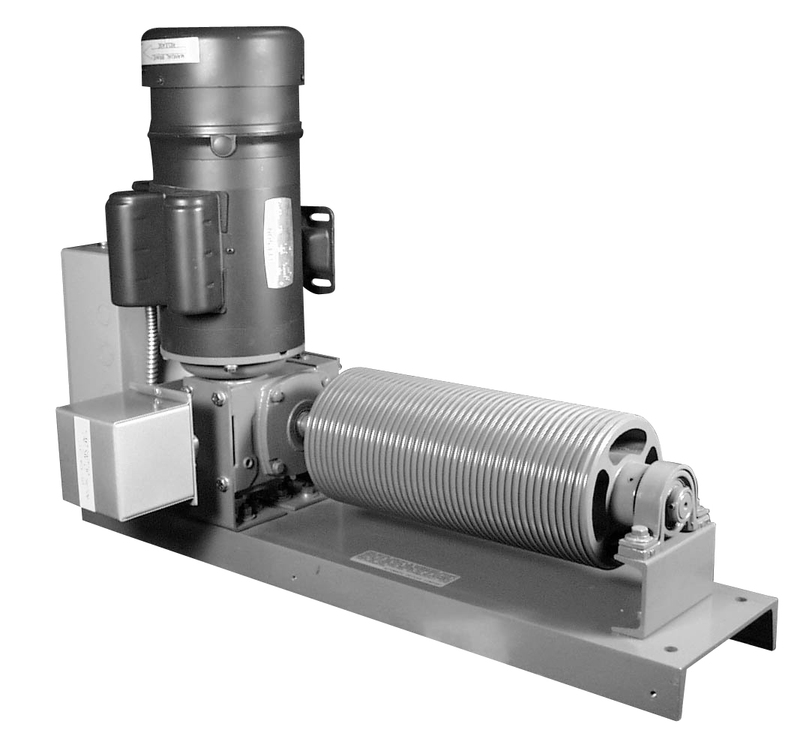 Models 2907, 7007, 8007 and 9007 ranging from 1/2 to 2 horsepower, are the select fixed speed lift machines of the ADC line. These units are capable of lifting, without the need of counterweights, substantial loads in accordance with established maximum weights. Each machine is equipped with built-in magnetic brakes and grooved cable drums to facilitate precise positioning. Standard features also include Stop, Start and Reverse low-voltage control, direct drive and rotary limit switches. Model differences are based on motor horsepower used. Configuration and size is same for all models. Helical Grooved Drum 14"L x 6"D. Provides up to 55' of travel. Models 8007 & 9007 connect to 230 volt, 3-phase power only. Curtain machines shall be fully automatic type equipped with ... HP motor, with built-in or in-line magnetic friction brake, right angle gear reducer on the output drive shaft of which shall be mounted elevator-type grooved cable drum and outboard bearing to support and align extended shaft. Drum shall deliver a lifting cable speed of 54 feet per minute. Mechanism shall include magnetic contactor to provide reversing action at any point along the travel and shall include three-button control station mounted on unit and one for remote control. Control switch wiring shall be accomplished through low voltage system running from control box on mechanism to remote control switch. Integral rotary limit switch shall be driven from output shaft of gear reduction unit. Machine shall be equipped with disconnect switch, overload protective breaker and emergency hand crank for conversion to hand operation. The entire mechanism shall be mounted on heavy steel base. Model ... as manufactured by Automatic Devices Company of Allentown, PA.